Announcing the newly published 2nd Edition of the definitive regression therapy classic. This edition features the most comprehensive methods for overcoming the long-term effects of trauma by deeply healing underlying issues, to yield profound lasting results. To celebrate this new release, we are offering savings for Randal Churchill's books. Bonus: If you request, the author will autograph your copy to you! a major advance in the teaching literature of Hypnotherapy. A brilliant blending of theory and practice, Regression Hypnotherapy is a must read and study for practitioners of hypnotherapy." "I recommend it highly for its lucid text, steeped in his many years of practice and his masterful training of hypnotherapists." "...the most important book about regression ever published." "This ultimate teaching text is destined to become a classic and will be used by hypnotherapists for decades to come." 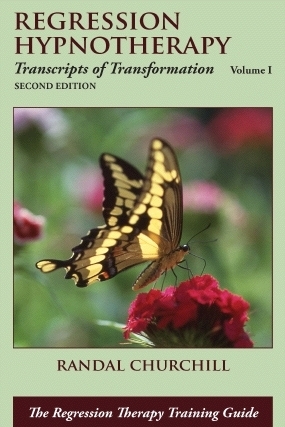 Catharsis in Regression Hypnotherapy: Transcripts of Transformation, Volume II. Announcing the updated and expanded 2nd edition of Randal Churchill's award-winning book, Become the Dream. has taught his pioneering regression strategies to thousands of therapists for 39 years. In this breakthrough guide he uses his unique style to weave together a powerful combination of methods for deeply transforming therapy to overcome the effects of major trauma. Regression Hypnotherapy documents the profound effectiveness of this work while giving the reader an inside look at the tremendous range of possibilities available in doing his 15-step Gestalt regression process. With great skill and innate sensitivity, Randal Churchill's common sense approach to therapy shines throughout. It is especially refreshing in demonstrating his care to produce accurate recall, brilliantly combining logic and careful neutrality with the very powerful use of hypnosis. From the author of the award winning Become the Dream, the first book about the integration of dreams and hypnosis, comes this eagerly awaited text by America's leading teacher in the field of regression therapy. In this highly readable and responsible guide for beginning and experienced hypnotherapists and clinicians, theory is combined with actual transcripts, bringing the reader an inside look at a wide range of sessions in which the author demonstrates the remarkable potential of regression hypnotherapy. Using his fine-tuned sensitivity and skill, Randal Churchill integrates a wealth of effective options such as hypnotic deepening, ideomotor methods, practical guidance in Gestalt strategies and positive suggestions for further insight and integration, to lead individuals to profoundly deep levels of inner healing. Hypnosis strategies that include regressing to an initial sensitizing event, emotional clearing, uncovering misconceptions that were developed and doing reeducation, sometimes has the effect of an imprint. The work can be so powerful that in many cases major lasting transformation takes place in one session. While the emphasis of regression hypnotherapy is on overcoming the continuing effects of unresolved traumatic experiences, this book also recognizes the many valuable uses of regression for non-traumatic exploration for self-discovery and insight, as well as bringing logic and important focus into the controversy of recovered memories. Of the 22 chapters, 13 focus on transcripts of regression sessions, with commentary, plus followup interviews weeks and/or years later. After the hypnotic induction portion of the session, comprehensive strategies include checking for subconscious direction via ideomotor methods, regression via the affect bridge, various Gestalt methods, uncovering misconceptions, and redirecting the subconscious. The irony of regression work is that what makes it important is its relevance to the here and now. We carry traumas from the past with us into the present and filter our experience of ourselves and the world through the lenses of those past experiences. What a difference a regression session can make...giant leaps forward with lasting results, as documented in this book. "Regression Hypnotherapy, by Randal Churchill, is destined to become a classic and will be used by hypnotherapists for decades to come. This ultimate teaching text is highly recommended for all in the field." "Randal Churchill has done it again! His first book, Become the Dream, received the ACHE Founder's Award for 'Excellence in Professional Literature' and his latest text, Regression Hypnotherapy, is certain to contend for another award. Memorable clinical examples, in the form of case transcripts, fix techniques in the reader's mind. The theoretical sections include insights about key concepts of Gestalt Therapy as modified and incorporated into Analytic Hypnotherapy. The methodology is presented with great clarity for practical integration into modern hypnotherapy practice. The process comments accompanying the therapy transcripts are invaluable. "Randal Churchill's merging of Gestalt Therapy concepts into regression, reeducation and integration processes of Clinical Hypnotherapy is a major advance in the teaching literature of Hypnotherapy. A brilliant blending of theory and practice, Regression Hypnotherapy is a must read and study for practitioners and students of hypnotherapy." Gil Boyne, Chairman Emeritus, American Council of Hypnotist Examiners "Randal Churchill has written a rich and stimulating book on the complex and ever sensitive topic of regression hypnotherapy. I recommend it highly for its lucid text, steeped in his many years of practice and his masterful training of hypnotherapists. The depth of Randal's experience and his thorough sense of care and compassion for his clients shine through again and again. Regression Hynotherapy is a superb contribution to the field." "Regression Hypnotherapy, written by one of the most insightful and innovative regression therapists in the field, is the most important book about regression ever published. Randal Churchill's unique style and gifted insight give clarity to the rich potential for transformation existing in the deeper intelligence of our own minds. With expert guidance and sensitivity, he leads individuals into the inner world of subconscious memories and emotions - assisting them through powerful emotional clearing and the access of their own inner wisdom for understanding and reeducation - transforming past traumas and emerging with triumphant clarity and peace. Churchill's skilled direction in actual sessions is an art form as well as powerful therapy." Randal Churchill is an American therapist who is well known for his expertise in all aspects of regression. In this book he has produced a readable and comprehensive approach to the subject which will appeal to clinicians whatever their level of experience. Regression is often thought of purely in its use with negative memories, and Randal does a great service by reminding us early in the book of its uses in finding lost valuables, remembering important details, and re-discovering past positive emotions and events. Research has shown that, when asked about their past, pessimists will recall negative events, while optimists will do the opposite. Hypnotically reconnecting someone with a negative outlook to a string of past achievements can be a powerful way to transform their perceptions. The book goes on to cover the use of regression with traumatic experiences, explaining clearly the difference between associative (emotional attachment), and dissociative (emotional detachment) techniques, and when each should be used. I found the chapter on suggestion, where he explodes some of the myths that have grown about the differences between direct and indirect suggestion, to be particularly interesting. Randal is a keen advocate of Gestalt work within a hypnotic framework and many of the case studies provide a clear demonstration of his excellent use of it. The second half of the book is taken up by well-written examples taken from his files which illustrate the theories described in the first half. This is a comprehensive attempt by Churchill to define his approach to Regression therapy and make it accessible to others. I think he has succeeded admirably. As a regular user of regression I still found much to excite and interest me. A common misspelling is Randall Churchill.